I just checked out the hottest new DVD in the ATV scene, “The Factory”. Wow, I’m impressed! Premis really hit one out of the park with this baby. Before I explain why I enjoyed the film so much, first thing’s first… On behalf of the entire industry, past present and future, thank you Can-Am for taking ATV racing to a higher level. 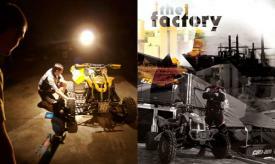 The movie can probably be considered a sequel to Beating the Odds, a documentary about four up and coming privateers, but to me The Factory is more like the Dust to Glory movie of the ATV industry than a documentary. The film does a nice job of taking you through the season and into the lives of Can-Am’s Epic and Warnert factory-backed teams as they compete for the first time in the ATVA Grand National Championship Series. Despite signing 3-time Pro National Champion John Natalie, Can-Am’s virgin voyage on their brand new Can-Am DS450 equipment was anything but proven. What’s more, half of the other new riders on Team Can-Am would be racing their first year in the pro class. I think it’s these elements that make the movie all the more interesting. And since The Factory is shot in high-def and each of the rider’s mechanics are equipped with wireless microphones the viewing experience is all the better. As he did in past productions, Premis Industries President, Brad Phillips assumed all the Executive Producer roles for the The Factory, while Director Brandon Boulay, who also played a role with the Carpe Diem 3 and Beating the Odds titles, grasped the film as his personal baby and did a fine job of entertaining me throughout the entire length of the video. In fact I found myself rewinding several times. Besides being right along side the riders and mechanics as they dealt with the trials and tribulations of the team’s first season of professional ATV motocross racing, I also got plenty of laughs from several of the stars. Sage Baker definitely comes to mind. The film has a way of making you feel as though you too are a part of the team. I’ve always said I’m living my factory-backed ATV racing dream through my little bro Cody Miller . Call me biased, but for me it was especially cool to see a factory-backed machine wrapped around a blue #22 number plate, and I seemed to smile the biggest during the Cody Miller parts. Perhaps my favorite part of the flick was when Bernard Guy, who calls himself Can-Am’s Directory of ATV Marketing (but seems to have a hand in everything at Can-Am), told the team at the final round that they have no intention of backing down. It’s my favorite part because he very well could have said that they are going to have to put the program on hold due to America’s financial recession. To those of you looking for Christmas gifts for the ATVer on your list, this is a no-brainer…. To you young guns in the sport with big aspirations, if this film doesn’t make you sit up in your seat and ignore your cell phone for an hour, you’re in the wrong sport…. And finally, to you old school former racers like myself, you need to buy this DVD and display it right along with your old trophies. It’s a monument to your devotion to a sport that very well could have dwindled away. The Factory retails for $29.95. You can order your copy of The Factory at premisind.com or purchase it at dealers throughout the country. Additional teasers and production photos can be found at myspace.com/thefactoryfilm. 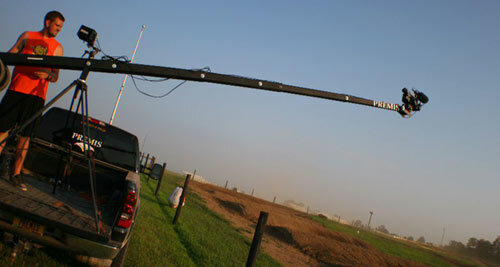 Founded in 2003, Premis has been a leader in re-shaping the way ATV motocross is viewed and promoted. Starting with their popular “Carpe Diem” series Premis has received a large amount of recognition for the way they have promoted the sport of ATV racing and its athletes. Premis has also been credited with releasing the first documentary for the ATV industry, Beating the Odds, which went on to beat out several non-ATV titles to win an Extremey Award. They have continued to raise the bar for other filmmakers by using innovative ideas and approaches to their films and other products.